After years of recruiting graphics architects, Apple has gradually shifted from licensing PowerVR graphics to designing its own custom GPUs for iPhones, according to David Kanter at Real World Technologies. 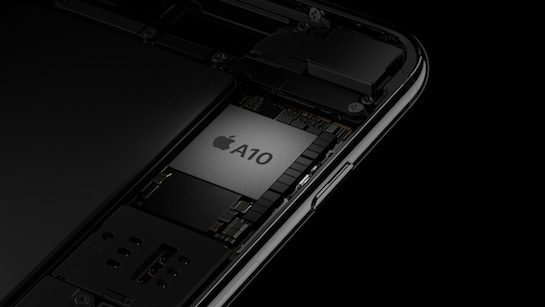 The new graphics processor is said to have first shipped with the A8 chip in the iPhone 6, with successive versions built into in the A9 and A10 Fusion chips powering the iPhone 6s and iPhone 7 lineups respectively. The first is the fixed-function graphics hardware, which is responsible for tasks like processing API commands, triangle rasterization, and raster output. The second is the shader core, which is the heart of the GPU and executes programmable shaders (e.g., vertex, geometry, pixel, and compute shaders). Last, the graphics driver is the software that runs on the CPU and ties everything together, coordinating the activities of the GPU. The driver transforms graphics applications written in the Metal or OpenGL ES APIs into a series of commands for the fixed-function hardware and programmable shaders that execute on the shader cores. Apple previously relied on PowerVR chipmaker Imagination Technologies to supply fixed-function graphics hardware, shader cores, and drivers for older-generation iPhones, but Kanter said Apple has since replaced the programmable shader cores with its own more efficient and higher performance design, and developed its own driver and compiler to emit code for its architecture. While Apple's GPU architecture has never been publicly documented, Kanter contrasted information from WWDC 2016 sessions and frameworks against basic PowerVR compiler and optimization manuals, concluding that it is clear that the shader core in Apple's GPU is architecturally very different from the PowerVR line. Apple's custom GPUs still appear to use some of the PowerVR fixed-function graphics hardware, but it is clear the company's dependance on Imagination Technologies has decreased significantly in recent years. Kanter speculates that if Imagination Technologies were acquired, or fell behind from a technical standpoint, Apple could simply design its own fixed-function hardware. Apple was actually rumored to acquire Imagination Technologies earlier this year, but later said it did not plan to make an offer on the England-based company at the time. Nevertheless, in recent months, Apple has recruited at least two dozen employees from the chipmaker, including former COO John Metcalfe, and those graphics engineers may have played a role in developing Apple's custom GPUs. Kanter said Apple has in fact assembled a GPU design team and a graphics driver team that together implemented a large portion of the custom GPUs in the A8, A9, and A10 Fusion chips. In addition to former PowerVR engineers, this team likely includes recent hires from AMD, Google, Intel, and Nvidia. The transition towards custom GPUs has is said to have resulted in several strategic advantages for Apple beyond increased performance and efficiency, including tighter ecosystem control, better time-to-market and scheduling, reducing its reliance on its suppliers, and reducing bugs without its competitors benefiting. This is surprising. They've been making GPU's for their shipping phones for two years and we never found out. I expect eventually they'll cut ties with Intel and bring it all in house so they aren't so dependent on Intel and their product roadmap. Yet every year or every other year we buy a phone an it's BLAZING fast because our two year old BLAZING fast phone now lags. Odd, as my 5S seems fine. Even a little snappier on iOS 10 compared to iOS 9. Performance plummeting with iOS updates happened a lot back in the day. Just look at the iPhone 4. A gorgeous, capable phone was utterly crippled by software. But that was largely due to the hand-over-fist performance increases that engineers managed to achieve with sub-mobile chips. Performance has grown exponentially. Much like the CPU boom of the late '90s. Now even an iPhone 5 has an appropriate experience on iOS 10. And that's 5 years old. Look at the competitors and you'd be lucky to get an update at all for a phone that age. I think Apple's chip design will become a more critical differentiator vs. Google/Android and Microsoft/Windows as those two companies push more aggressively into building their own phones and computers and market an integrated hardware/software experience. It's once they build it out we'll hopefully see the true results. The main chips have been staggering performers so a fully-ramped Apple GPU chip is likely to blow us away. I don't play games on my iPhone 6s but in that video they load up almost instantly compared to the pixel and this time the resolution of the devices is on par. (A previous criticism made against historic comparison videos.) The other tests are often on par or so close going to either device but the game loading speed is mind blowingly fast... Apple console ahoy??? Beyond impressive... maybe Apples plan is to storm the mobile games market were it has historically lost in the PC gaming market. Watch the video game progress on the iPhone @ 5:23 (game starts at 5:14). You'll see reflections in puddles on the road. The same game on the Pixel doesn't reach that point until 5:41 and there are no reflections. Not only is the iPhone much faster than the Pixel, but it's rendering a scene with much greater complexity. I suspect that's due to Apple's internal GPU efforts. I do expect Apple will carry this expertise into the Mac family, giving Wintel more serious competition while retaining margin on their own IP. Apple can't possibly like waiting for Intel to make progress while simultaneously paying them for the "advantage" of the X86. I have a feeling Apple will eventually replace integrated graphics on macs with in-house custom developed chips. A dedicated high performance per watt GPU in future ARM'd macs. This will be the fruit of the ARM race. However, Macbook Pros, iMacs and Mac Minis all have rubbish integrated GPUs that can't do anything. Your only way to handle most games properly on a Mac is to get a Mac Pro (which is too expensive for most to justify purchasing). Buying a Mac Pro for gaming is stupid. Nobody who knows what they're buying does that. There is no Mac suitable for games. The Mac Pro is designed for professionals, who benefit from computers which can handle high parallelism. Games do not qualify. In related news, there's a performance comparison video of Pixel vs iPhone. It's a bloodbath. Those ridicolous waiting times compound in minutes, hours, days of your life lost staring at a progress bar.